As explained in Part 1, the December 2012 end of the world is only one of thousands of ends that face us every moment of existence. Whether we worry that the world will end by a natural catastrophe or by divine judgment, such fear has its roots in Stage I religious mentality. 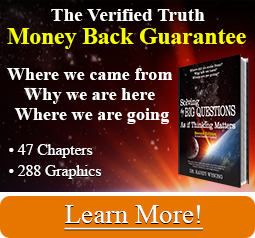 (See Solving The Big Questions) People throughout time have thought that the world revolves around them and that they and their special generation have been singled out. It is human to think that our time is the best of times and the worst of times. We are not alone in thinking this way, "The Earth is degenerating today. Bribery and corruption abound. Children no longer obey their parents, every man wants to write a book, and it is evident that the end of the world is fast approaching." From an Assyrian tablet, 2800 B.C. An almost identical message is said to have appeared as graffiti on a wall in Pompeii. Today we certainly do live in a unique age in which the tempo of change is accelerating. Since technology has no conscience and increases our destructive capacity, it is surely something to fear and rein in. Technology also gives us glimpses into details about reality that can result in even more predictions of doom. Movies, books, television programs, and political platforms about out potential doom from an ice age, heat age, meteor strike, tsunami, volcano, ozone hole, or earthquake constantly remind us of our precarious existence. The more we know about the intricacy of the universe, the less safe our situation seems. But just because we come to know more and more doomsday scenarios does not make them any more likely than if we were totally ignorant of them. Knowledge of potential disasters we can do nothing about can only create fear and hopelessness. These psychological states can ruin health. They can also make us desperate for a safe haven and a solution. This in turn makes us vulnerable to sloppy thinking, experts, and prophets. No, it is not likely that at this particular time (a flea's breath on the line of infinity), the universe is going to pick on us. If all of humanity jumped into the sea, it would rise the height of an eyelash. We are puny and everything is not all about us. Instead, we should be thankful for the continuing miracle that makes us exist at all. Ancient texts usually painted a theological veneer on natural disasters. It was also a common practice to look around for the villains who by their evil ways brought on the wrath of God. Witches, pagans, infidels, savages, and cats have been popular culprits. Prevention was practiced as well. The Hebrews slaughtered animals on altars to appease Yahweh. Christian flagellators, emulating the persecution of Jesus, walked about the countryside whipping themselves bloody (and were swooned over like rock stars by the peasants) to appease God's anger manifesting as the black death. The Mayans used a stone knife to cut open screaming victims, reach in and tear out the beating heart and spill the blood as a votive offering to the sun god. If a god was visiting catastrophe on the people and taking lives, then preempt his blood thirst and offer up a few maidens or fatted calves. Lo and behold, the storms eventually stop, the volcano quiets, and the drought ends. It works! Fear, guilt, atonement, and redemption tie in with divine doomsdays to make them seem plausible. It is hard to imagine what the world must have seemed like in pre-scientific times. As far as our ancestors knew, land and oceans stretched forever. No one had any idea what the sun really was, why it kept popping up out of the Earth every day, what thunder and lightning were, and why floods and droughts happened. Tornados, earthquakes, and volcanic eruptions must have been especially horrifying. What an incredibly awesome, humbling, unknown, and scary world it must have been. Everything seemed to happen as if it were magic. Many of our fears today are quieted by understanding some of the mechanics of nature. We can make predictions of the course of a hurricane, or interpret the seismographic subterranean rumblings prior to earthquakes. In early times, however, natural disasters came out of nowhere. As far as our ancestors knew, such terrible events would remain forever. As is only human, they decided something had to be done. People sought understanding and control with the only tools they had: limited knowledge and conscience. As explained in Living Life As If Thinking Matters, conscience is ingrained and we all feel perpetually inadequate to it. This creates almost a constant state of guilt and a sense that punishment is due. Couple this with the obvious conclusion that something much more powerful than humans must have created the world, and a formula for an explanation emerges: Disasters are a punishment from god(s) for wrongdoing—violating one's conscience. Or, as societies developed at odds with one another, people blamed disasters on the evil ways of the bad guys on the other side of the mountain. As Stage III religion progressed (See the Solving... book), disasters became the result of not paying heed to the rules laid down by religious leaders to appease the gods. The suffering, death, and destruction caused by natural disasters led to the assumption that the god in charge of those disasters liked to use suffering, death, and destruction. Thus there arose a vindictive god who cast plagues and pestilence upon the land, desiccated the Earth with drought, drowned it with floods, and melted it with volcanoes. He was upgraded and embellished to a more terrible god who would torture people infinitely in hell for an "original sin" they did not even commit. Such fear mongering incites the base survival fight and flight instincts and sends people scurrying out of their intelligent forebrain into the ancient animal survival recesses of their hindbrain. In panic, they surrender to religious medicine men who claim to have the cure. Humans absolutely require a sense of control or they go mad. People felt as though they were experiencing a repeating theme of suffering and triumph, good and evil, as they sought meaning from the heartless acts of nature. If a natural catastrophe is brought on by bad behavior, then the solution was to be good. If we were unable to behave ourselves, then putting some form of absolution in place for redemption would also be important. Even in the secular world the psychology of guilt, failure, punishment, and redemption are played out. Global warming, a phenomenon that can occur with or without humans present on Earth's crust, has become like a doomsday prophecy to zealous environmentalists: The world may end because man and his evil industrial ways deserves to be punished. Yes, we must be good stewards of the planet and could do ourselves in with environmental neglect and abuse. But to conclude that humans can really affect the macrocyclic forces of the whole planet seems ambitious and is reminiscent of our tendency to think we are the cause and center of all things. If we are the cause of them, the narrative continues, then we can fix them and save ourselves. We must feel we can control. Since we teeter on such a precarious knife edge of existence dependent upon forces over which we really do not have full understanding or control, the only sane thing we can do is take control of our own actions. We best do that by using our embedded conscience, rational thought, a reverence for facts and truth, and, most importantly, thinking beyond our immediate needs, security, and pleasures. The world will indeed end someday, but if we would use that simple formula for living, the world we do have would be the best it could be. In Part 3 (if we are all still here) we'll learn how volcanoes in ancient history shaped the language and theology of the major religions that center on judgment days and the ends of the world.